Two species that are closely-related should compete for resources more strongly than two species that are distantly-related. This is a prediction Darwin himself made, and while it hasn’t been tested very much, it has been assumed to be true ever since. In 1967, MacArthur and Levins formalized the prediction1, and at least according to some biologists, it is “central to ecology and evolutionary biology.”2 It’s one of those ideas that makes sense in an evolutionary framework but is hard to test. As a result, most biologists have just assumed that it is true. Well, while studying algae, Dr. Bradley J. Cardinale and his colleagues inadvertently put the idea to the test. 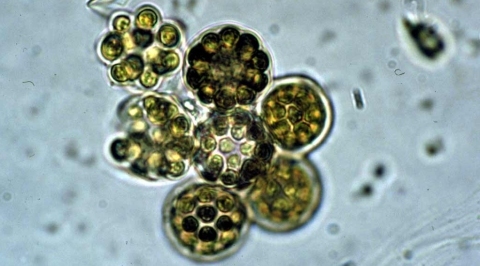 They were trying to measure the competition that existed between 23 different species of green algae, such as the one pictured above (Coelastrum microporum). All these species are commonly found existing together in North American ecosystems, so it is assumed that they compete with one another. In their experiment, they took two different species from the group of 23 and put them together in a laboratory environment. They then measured how the two species competed with one another. Now remember, they were looking at 23 different species, but they only put two species together to compete with one another. In order to look at all possible combinations of these 23 species taken two at a time, then, they had to examine 253 separate situations. They examined each combination of species twice, to make sure that their results were consistent, so they looked at a total of 506 competitive situations. However, in order to compare how the species did in competition to how they did without competition, they also had to put each species in a laboratory environment on its own. They examined each of those situations twice as well. In the end, then, they examined 552 different situations of algae growing in a laboratory environment. In other words, this was an extensive experiment. The results of this extensive experiment were rather surprising, at least to the investigators and many other evolutionists. Despite large variation in the nature of interspecific interactions, the average interaction strength did not vary as a function of the evolutionary relatedness separating interacting species. So it seems that at least in the case of these common North American green algae species, the evolutionary prediction was falsified. The authors cite four other studies (including reference 2 in this post) that also seem to falsify the prediction. While I would love to say that this “closes the book” on yet another failed evolutionary prediction, I have to point out that there are some studies that seem to verify the prediction. For example, a 2011 study showed that a group of microorganisms that like to eat bacteria compete with one another exactly how the prediction says they should.4 At minimum, however, I think it is safe to say that while the prediction might be valid in some situations, it is not applicable to the biological world as a whole. That, in itself, is a useful result. Before I end this post, I would like to mention one other result from the algae study that the authors found “surprising.” They noted in their analysis that 23 percent of algae populations actually did better when put in “competition” with one another as compared to when they were allowed to live on their own. I don’t find that surprising at all. As I look at the way God has designed the world, I find that cooperation is common among species (see here, here, here, and here, for example). It really does seem like many living organisms were made to live in a close relationship with other organisms from different species. I wonder how much better our understanding of ecology would be if more ecologists started looking at ecosystems in that way. I think this is what would be expected from there being no general rule. Some studies will confirm it and others will disconfirm it. You run enough experiments and you will eventually find a statistically significant result. The “Significant” xkcd comic illustrates this well. What I don’t understand is why it is an evolutionary principle. It seems to fit into a creationist viewpoint just as well. It seems that competition would be most strong among organisms that take similar inputs. Seems similar to the argument that DNA similarities show common ancestry. They could just as easily show common design. I agree with your first point, Matthew. Most likely, there is no general rule. However, I would have to disagree that the rule fits into a creationist view. Remember that from an evolutionary perspective, competition is the driving force for natural selection. There are limited resources, and all organisms are fighting for those resources. The ones that can get to the resources most effectively will be the ones that survive. As a result, a new species arises because some random change develops that allows the new species to outcompete the old species. In the creationist perspective, competition might provide some selective pressure, but it is not the driving force. Instead, the Creator made flexible genomes to allow organisms to adjust to changing conditions and exploit new resources. As a result, natural selection mostly comes into play when conditions change or new conditions become available. So a new species arises when something changes, producing a new resource to exploit or a new problem to overcome. There is likely little or no competition involved in such adaptation. The one species continues to exploit the old resource (or solve the old problem), while the new species exploits the new resource (or solves the new problem). Something I’ve often wondered, but have never been able to find an article that explains, is how Evolution reconciles the complexity and fragility of many ecosystems with such a concept as this hypothesized fierce competition. If there were such intense competivity between species, as Darwin predicted, to the point where closely related animals drive another to extinction more rapidly, then wouldn’t that cause ecosystems to collapse before animals dependant on the extinct species had time to adapt? Is this considered part of Natural Selection? Because at first glance, it seems as if this would constantly inhibit Evolution, since species in the process of evolving could lose a vital sustainer of their lifestyle. In general, Jacob, evolutionists think that when one part of the ecosystem goes “out of whack,” it presents an opportunity for another part of the ecosystem, which eventually brings things back into balance. So, for example, as humans started to evolve and get really good at hunting, they wiped out the predator population (for both food and protection). This threw the plains ecosystem out of balance, and the herbivore population exploded because they had few predators. However, because there were few predators, humans had to start hunting herbivores for food. Also, because there were a lot of herbivores, they overgrazed, depleting their own food sources. The depleted food sources and the increased herbivore hunting by humans decreased the herbivore population. At the same time, what predators were left had all sorts of food resources that were easy to get, because there were so many herbivores. As a result, their populations slowly increased. All this worked together to bring the plains ecosystem back in balance. So in the end, evolutionists usually think that the exploitation of one resource will generally present opportunities for other members in the ecosystem, eventually putting things back in balance. Now I personally think this is not reasonable based on situations like the rabbits in Australia, where the introduction of just one species threw the ecosystem completely out of whack, and the only way to fix it was for people to intervene with technology. The evolutionist, however, would counter that this didn’t happen slowly over time, which is what happens in real evolution. Had the rabbit actually evolved in Australia, it would have happened slowly, and the ecosystem would have evolved to deal with it. The link to this blog from the reddit creation site says ‘complete’ instead of ‘compete’? I don’t know the reddit creation site, dionisio, so I can’t really do anything about that. That makes sense. I was thinking about it from population dynamics and assuming a single source of food preyed on by two similar animals but that is unrealistic in most circumstances. I think one fascinating discovery is a bacteria that was able to “evolve” a gene to digest nylon. It adapted an existing gene so it could digest nylon byproducts. Even if the competing species are competing over a limited food supply some might adapt to utilize new resources. Could you imagine a human made machine that could adapt to utilize new power sources on the fly? What’s really cool about the nylon-digesting bacteria, Matthew, is that we have a good idea about how the ability came about. The bacteria have a plasmid, called pOAD2. This is a small, circular bit of DNA that is not a part of the bacterium’s main chromosome. There are five transposable elements on that plasmid, and that’s where the genes for nylon digestion exist. In the lab, the ability for non-nylon-digesting bacteria to become able to digest nylon is repeatable and happens within days of starting the experiment. This implies there is no random chance involved. Instead, the plasmid is there specifically to give the bacterium the flexibility to adapt to new food sources. Most likely, it’s the transposable elements that make the plasmid so flexible. In the end, then, these bacteria have shown us one way that God designed variability into the genome, at least for bacteria.